Native Instruments today announced that the new generation of its critically acclaimed groove production studio is now available in stores worldwide and at the NI Online Shop. 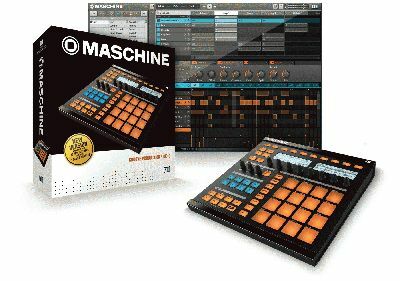 As of October 1, 2012, the MASCHINE range of products have received a major overhaul with new updates to hardware and software, the addition of colored CUSTOM KITS and the MASCHINE STAND, and a free separate download for MASSIVE, available to all new and existing MASCHINE users. The free MASCHINE 1.8 software update introduces the new color-coding system to the software. Sounds, groups, patterns and projects can be assigned specific color schemes, which are reflected in the colors of the pads and buttons on the new hardware, providing instant visual feedback and improved workflow. Furthermore, the new software also includes advanced offline time stretching and pitch shifting capability as well as a range of new effects, including NI's hugely popular dynamic mixing effect Transient Master. Numerous workflow improvements such as Host Transport Control, Browser Sample Preview Mode, Auto-Write Pinning and more plus a number of new hardware shortcuts allow for faster and even more intuitive control of the software via the MASCHINE hardware. These features are available for users of both the first and the new generation of MASCHINE hardware. Another major new addition to the 1.8 update is the inclusion of NI's critically-acclaimed synthesizer MASSIVE – an instrument renowned for its genre-defining bass and lead sounds. The full version of the synthesizer is included, adding 1,300 additional sounds to the MASCHINE library. Anyone updating to the 1.8 software will receive MASSIVE as a separate download after software registration. Previous users of MASCHINE will receive an email containing serial number and download link. Particularly useful on stage, the included Mounting Adapter connects the unit to standard snare drum stands, for neat integration into drum setups. The MASCHINE STAND is compatible with the new black/white hardware or first generation MASCHINE, but not MASCHINE MIKRO.